As I was looking through catalogs last year, I came across Childcraft's LOTTO games (click on the Childcraft catalog, then search for LOTTO) and I love them!! Each grade level (PreK-K, 1st grade and 2nd grade) has lotto games for Science, Social Studies, Literacy and Math - and each set has 4 lotto boards. Each set is $39.99. All told, there are 48 total boards if you purchase them all, and they all address grade level standards. 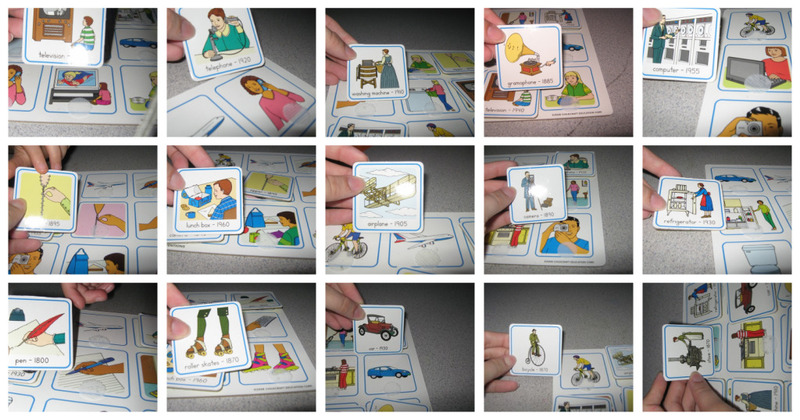 And they can be used to play concentration-type memory games, BINGO or match the pictures to the board to play LOTTO. I typically use them as LOTTO games because several of my students are working on matching pictures. Some of the pictures are identical to those on the boards, some are not (for example, in the colonial days game, the pictures on the board are of "present" and the pictures for matching are of "past", and you match a picture of how people did things in colonial days to how we do them today). At the risk of sounding like a broken record, I *love* these! They provide an activity that my students can successfully engage in while introducing them to the concepts covered by the standards. I find the social studies and science ones to be the most useful, as it's harder for me to adapt those standards than the language arts and math ones. Here are pictures of the "inventions" board and how I use it with my class. I put all of the loose pictures in a basket or box, shake it up, and have one student pick a card - then I look at it with them and say "This is what a bicycle looked like when it was invented in 1870 - can you show me what a bicycle looks like today?" then they find the bicycle on their board and match the picture. What are some of your favorite materials for accessing or adapting the general education standards/curriculum? 0 Responses to "Childcraft Lotto games"